Otherwise known as Vitamin B7, biotin is a water-soluble substance that makes up a key group of nutrients that the body needs to maintain a healthy metabolic rate, nerve function, proper digestion, and even cardiovascular health. You can find biotin in several different foods, including eggs, cheese, salmon, cauliflower, and even whole grain bread. However, the benefits of biotin are such that you may want to take a supplement to get the full effect. The primary function of biotin is to metabolize the amino and fatty acids along with glucose to improve the energy levels in the body. 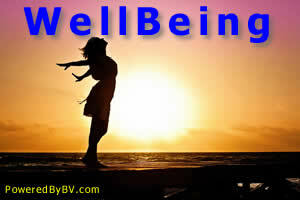 When you consume proteins, carbohydrates, and fats, the biotin converts them to macronutrients which the body absorbs. By helping the body to process the good foods that are consumes, the benefits of biotin become apparent to anyone who wants to maintain their overall health and wellbeing. In addition to helping the body to process the good nutrients, biotin also helps prevent premature aging of the nails, skin, and hair. In fact, biotin is often used in hair and skin products to create a more youthful appearance. Keep in mind that biotin works best when it is ingested as part of the food you eat or as a supplement since it does not absorb directly into the skin very well. The issue with many of the symptoms is that it may not lead to the conclusion that you need more biotin in your diet. If you suffer from any of these symptoms, you should check to see if you are consuming enough biotin in your diet and perhaps augment that with supplements. 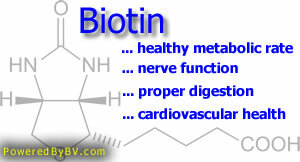 Biotin benefits … maintain a healthy metabolic rate, nerve function, proper digestion, and even cardiovascular health. Although biotin supplements may be recommended in some cases, if you eat a healthy diet that includes fish, legumes, mushrooms, eggs, berries, and organ meats, you will get plenty of biotin in what you consume. If you feel you may need a boost of biotin, Body Strong, has a 100% daily dose of it. There is research to suggest that even if you do not consume the recommended amounts, the digestive bacteria in the intestinal tract may generate biotin or Vitamin B7 which is then absorbed into the body. The benefits of biotin are such that ensuring you consume enough daily is important if you want to maintain your energy levels and avoid the many issues associated with the lack of biotin in your diet. Just by adding legumes, eggs, or fish to your diet may supply what your body needs, but you should also consider biotin supplements if you suffer from medical conditions that may rob you of the biotin needed for proper function.